We have tested our range of Ergonomic Wheels against other types of wheel material – including our own standard range – and also our competitors. 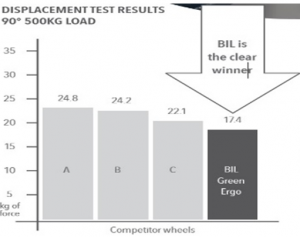 The BIL/Muvtons Green Ergonomic SRPTA wheel outperformed all other compounds and those of the other manufacturers. Our combination of the special compound polyurethane wheel with 85 Shore A hardness, in conjunction with the crown tread on the tyre gives outstanding performance. Our industry leading wheel greatly reduces the amount of effort required to maintain straight-line movement and start-up co-efficient. This will effectively enhance the ergonomics of any heavy dollies or trolleys that they are fitted to. The same truck used for each test. Testing will always be carried out in the same designated place. Trucks will have two fixed castors at the rear and two swivel at the front. Total weight declared for the test will include the truck weight. The strain gauge will be calibrated annually. Measurement of ambient temperatures and relative humidity. Testing was in two parts. The front swivel wheels will be placed at 90° to the front of the truck facing the same way. The strain gauge will be attached to the centre of the truck handle. The maximum force required to move the truck over three feet will be recorded. The test will be repeated five times. If any of the results are greater than 10% of the average force then the test is repeated. The average of the five tests will become the published force/measurement. The strain gauge will be attached to the centre of the truck handle. The truck will be pulled to start the test over a marked two foot distance, from this point the highest measurement taken to maintain movement over a six foot distance will be recorded. The Test was conducted according to displacement test procedure. Line dolly loaded with 500kg. Front wheels facing 90 away from direction of travel. All samples tested from all sources are comparable in specification i.e. special grade PU. The full Test Report is available if you would like to see it. You can request a copy here.